CorelCAD 2017 lets you discover the powerful and affordable CAD software that transforms 2D designs into 3D reality. It provides customizable 2D drafting tools and superior 3D design tools within an interactive workspace to achieve your CAD goals in all types of industries. 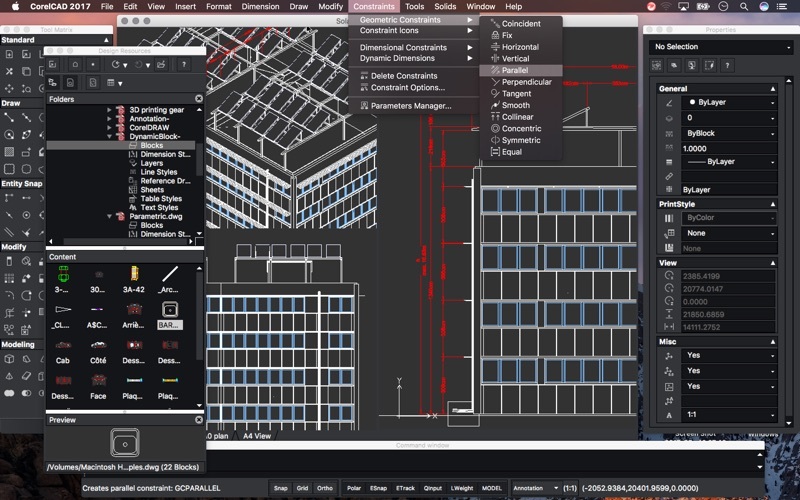 Increase your workflow productivity with native .DWG file format support for worry-free collaboration with colleagues and business partners on CAD files. Work in a familiar environment with the ribbon UI, 3D print-ready features, and STL file output. Optimized for Windows, OS X, and Android tablets, CorelCAD delivers impressive speed, performance, and customization on the platform of your choice. Powerful and affordable CAD software – Increase productivity with high-performance CAD software that includes 2D drafting, 3D design tools and advanced .DWG file support. Industry-standard CAD features and UI – CorelCAD is compatible with all major CAD programs so users will feel at home working with a classic UI and traditional menu items or modern ribbon UI workspaces. Users can also migrate and import custom ribbon workspaces from other popular CAD programs directly into CorelCAD. Precise 2D drafting tools – Create incredible designs and projects with generic 2D drafting features and precise drafting tools, including dynamic, on-screen snap and guide tools, new drawing constraints* to create and edit geometric and dimensional constraints, in-place text-editing, and quick and smart dimension tools. Versatile 3D design tools – Evolve into 3D design, taking advantage of the 3D Solid Modeling tools for creating primitives and advanced 3D shapes using 3D editing operations. Extrude or revolve 2D entities, sweep 2D entities along a path, or loft between 2D entities to create solid objects. Join the 3D design revolution by using 3D tools to create initial project sketches to the finished product of 3D printing output. High-performance CAD engine – Experience the solid state-of-the art CAD expertise and performance with the renowned ARES platform. With modern code and a popular 64-bit application, you’ll have the speed you need for productivity and streamlined workflow. Clear-cut annotation and collaboration – Expand the reach of collaboration with the innovative VoiceNotes tool, which lets you add recorded messages, reminders or instructions directly into your drawing. Mark up drawing items with freehand sketches and mask portions of a drawing to exempt them from annotations. Highlight areas that require or contain revisions by accentuating drawing areas with Revision clouds. CorelCAD also includes PDF Underlay, DGN (Bentley Microstation) Underlay and GIS (ESRI .SHP file) support for repurposing assets from related workflows. Popular publishing options – Output your CAD designs with advanced print and plot functionalities, including batch plot and print configuration management. CorelCAD provides many industry-standard output options such as PDF, EPS and SVG file formats. With the advent of 3D printing technology, your design projects now have unlimited potential and output possibilities with STL file output support for sending your 3D model to a 3D printer. Next story Live Home 3D 3.3.1 – Powerful interior design app. Previous story EverWeb 2.5.1 – Drag-and-drop website builder.